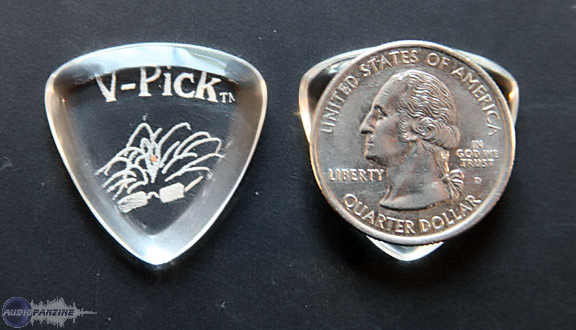 Diamond, Guitar Pick/Plectrum from V-Picks. 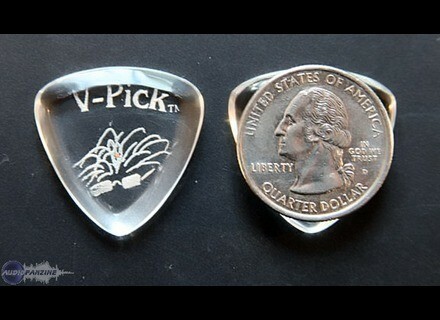 V-Picks announce V-Pick Diamond. This is a laser cut, hand ground and buffed by Vinni Smith himself. It's the same size as the V-Pick Medium, but thicker at 3.75mm This is thicker than a regular V-Pick, but half as thick as a Big Fattie. It is not rounded but not pointed either. Somewhere in the middle. "Great for lead and rhythm. Lots of pinch harmonies and fast, fast, fast! It really is an all around, go-to pick", says Vinni. For more info about the Diamond guitar pick click here. Dimarzio DP 175 True Velvet Neck DiMarzio presents the DP 175 True Velvet, a Strat-style single coil pickup. Fender releases the David Gilmour Strat The Fender Custom Shop has announced the release of the David Gilmour Signature Series Stratocaster® guitar, a signature model based on Gilmour’s famous “Black Strat®” guitar. Reverend Double Agent Guitar Reverend has introduced the Double Agent guitar, the latest addition to their Bolt-On Series.